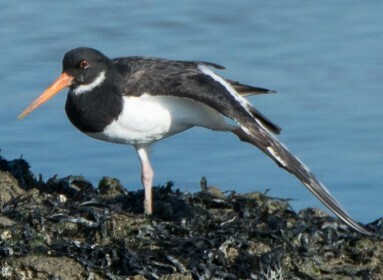 The Oystercatcher is one of the most widespread and familiar birds round our coast. With its striking black and white "pied" plumage, long red beak and legs and that piping call, it is one of most easily recognised of our shore birds. Oystercatchers are a group of waders with a single genus Haematopus. This name comes from the Greek haima meaning blood and pous meaning foot. 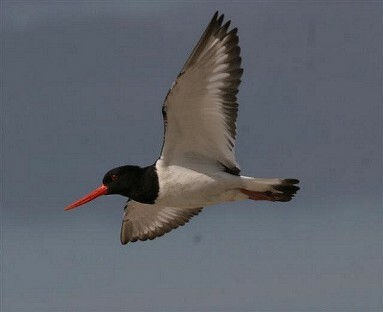 The name Oystercatcher seems to have been first used in 1731 and gradually it replaced an older name, sea pie. There are twelve species worldwide. Four are black and the others are pied including our familiar one the Eurasian Oystercatcher which breeds on the coasts of Europe and north Asia and winters as far south as Africa and south Asia. Oystercatchers do not just eat oysters. The diet is more varied and they can be seen feeding on a whole variety of types of shore from rocky to sandy. While predominantly eating bivalves like cockles and mussels, they take a wide variety of other food including gastropods, worms, limpets, chitons, fish, crabs and on inland sites, they will take earthworms and insect larvae. There is a suggestion that individuals specialise by either hammering the bivalve open through the shell (these birds have blunt bills), or prising the two shells apart (these birds have pointed bills). On Arran the Oystercatchers that you see in the breeding season are not necessarily the same birds that you see in the winter. From ringing records most Scottish birds migrate south to winter in England, Ireland and the continent and are replaced by wintering migrants from further north like Fennoscandia, Iceland and the Faroes. Also from ringing information there is a record of a bird living for forty years but the typical lifespan is about twelve years. While the sexes are similar, males on average have shorter bills and out of the breeding season both sexes have a distinctive white chinstrap. 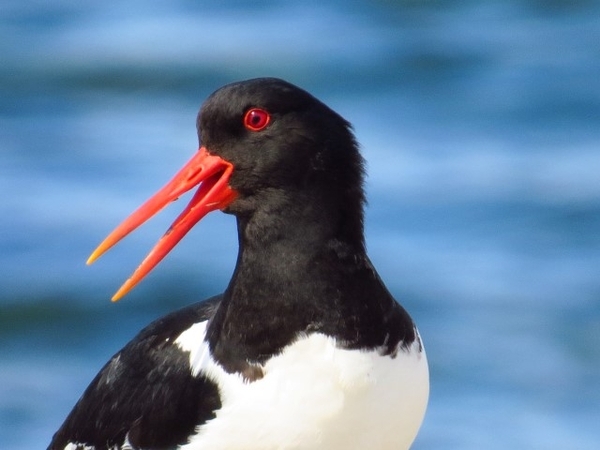 In the early nineteenth century, Oystercatchers in Scotland bred almost exclusively on the coast. By the twentieth century, they had began to colonise inland lochs, river valleys, meadows, upland moors and even flat roofs, particularly those that resemble gravel beaches. This may be in response to coastal habitat loss and human disturbance. Oystercatchers do not start breeding until they are at least three years old. There is strong mate and site fidelity, with one record of a pair defending the same site for twenty years. A single nesting attempt is made per breeding season, which is timed over the summer months. The nests of oystercatchers are simple affairs, scrapes in the ground which may be lined, and placed in a spot with good visibility. The eggs of Oystercatchers are spotted and cryptic. Between one and four eggs are laid. Incubation is shared but not proportionally, females tend to undertake more incubation and males engage in more territory defence. Incubation usually lasts between 24–27 days. Oystercatchers are precocial that is the young hatch, not helpless like Blackbirds, but relatively mature with eyes open, feathered and ready to run! Two or three chicks are raised each year, and the chicks rely on their parents for food for several months. Throughout that lengthy breeding period from early spring to mid-summer, birds breeding on the shore are particularly vulnerable to disturbance. It would be a great help if dogs on the shore were kept on leads at this time.